Baju Melayu is a traditional Malay outfit for men. The Muslim males in Malaysia wear the traditional dress, baju Melayu, during festivals and wedding gatherings.They will usually wear accompanying accessories like the songkok(black hat) and samping(extra piece of sarong wrapped around the waist). 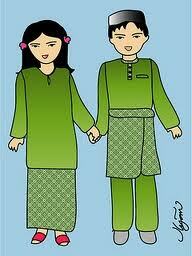 The female version of the baju melayu is called the baju kurung. Baju Kurung is the traditional dress for the Muslim ladies in Malaysia.It is simple and graceful,and covers most part of the wearer’s body in compliance of the Islamic teaching. The most popular and widely-recognized Vietnamese national costume is the Áo dài, which is worn nowadays mostly by women, although men do wear Áo dài on special occasions such as weddings and funerals. Áo dài is similar to the Chinese Qipao, consisting of a long gown with a slit on both sides, worn over silk pants. Bruneians wear traditional Malay costumes. Men wear baju Melayu. Brunei women dress in brightly coloured apparels. The dresses usually cover their body from head to toe. They wear a head scarf in public places and in government offices. Lao women wear the silk skirts, blouses and scarves to attend important ceremonies. Lao men wear salong, big large pants or the peasant pants. A Kebaya is a traditional blouse-dress combination worn by women in Indonesia. It is sometimes made from sheer material and usually worn with a sarong or batik. Indonesian men generally wear sarongs (usually with a checkered pattern) in the home. In public, the sarong is worn only when attending Friday prayers at the mosque. For formal national occasions, the men wear batik shirts with trousers or teluk beskap, a combination of the Javanese jacket and sarong. 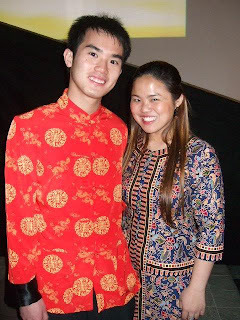 The barong Tagalog (or simply barong) is an embroidered formal garment of the Philippines. 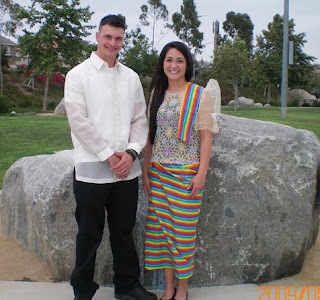 In Filipino culture it is a common wedding and formal attire, mostly for men but also for women. The balintawakis the traditional Filipino costume for women.The costume typically features a white or cream-coloured blouse with puffy-butterfly short sleeves. The women’s national costume is named the Chakri. It is made up of Thai silk. 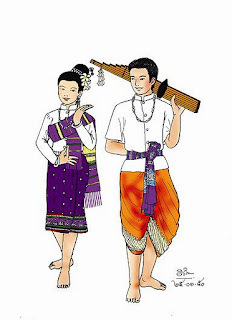 The dress includes a back-less and shoulder-less shirt, a ready-to-wear skirt with Na-nang ( a typical Thai cutting style on a center of a skirt), and a shawl which is made by organdy.The men’s national costume is known as sue phraratchatan (royally bestowed shirt). The traditional Cambodian sampot is a woman’s long skirt with a fold or pleat in the front, but some sampot styles actually look more like trousers. It is worn with a modest shirt or blouse. On special occasions women match the color of their sampot to the traditional color for that day. Cambodian men typically wear cotton or silk shirts with short or long sleeves. They wear cotton trousers as well. Singapore does not really have its own national costume because there are 4 different main races which are the Chinese, Malay, Indian and the Eurasians. Each race has their own costumes. Information compiled by Ekachai Phaichamnan. Last updated : August 11th ,2012.